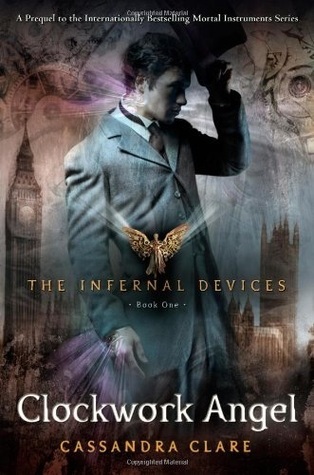 Review: Clockwork Angel by Cassandra Clare - Book.Blog.Bake. I have to admit, I’m a bit perplexed when it comes to this book and how I feel about it. On one hand, it was an entertaining and enjoyable read, but on the other, I feel it just totally lacked originality There’s scarce here that I haven’t seen before. I haven’t read the Mortal Instruments, as I read the first chapter of City of Bones and decided I wasn’t interested enough to buy the book, though I’ll probably eventually rent it from the library, so I don’t really know if this is the standard for Cassandra Clare, but I just don’t see much that’s new here. I feel like Clockwork Angel is what you get if you took the TV show Supernatural, the Harry Potter series, added a dash of love triangle and Victorian London and put it all together in a blender. Don’t get me wrong, there are things about the book I enjoyed. I like the characters and the two potential love interests, Will and Jem, quite a bit. I don’t find them original characters, but I do find them entertaining and I’m always a fan of sarcastic characters, so I give the characters a two-thumbs up. The book is well-paced, and I love the setting, which is why I picked up this book over City of Bones. I’ll take London over New York any day, thank you. The plot is fairly compelling. It’s not exactly jaw-dropping, and I think it’s fairly easy to guess the “Big Reveal” early on, but it still entertaining. There are things I didn’t see coming, and I like the addition of the clockwork army. There are bright moments, but overall, this book felt a bit disappointing, especially since I heard so many people rave about it. I just didn’t find enough that I liked to make it super compelling. It wasn’t a book I didn’t like, but it wasn’t necessarily a book I liked either. Final Impression: Entertaining at times, but falls flat in many areas. I’m a bit torn about my rating and wavering in between 2 and 3 stars, but I think the setting was compelling enough for me to give it 3/5 stars(but really more like 2.5/5). I love this series and I just love all of Cassandra Clare’s books!! Enjoyed your honest review! It’s always tough when we don’t love a book that others have raved about. This one just didn’t appeal to me for some reason, so I never picked it up. Hope your next book is more to your liking! I always feel bad for not liking the books everyone seems to LOVE, but I guess that’s what makes the diversity of reading opinions so great! It’s too bad you weren’t thrilled with the book…I’ve been thinking about reading the series for quite a while now. I wonder how many other people feel the same way? I’ll have to check out more reviews. Thanks! I’d still recommend reading it! Despite my hesitations about the book, it’s still a pretty good read, and the setting is fantastic. I wasn’t quite as in love with it as I wanted to be, but I know a lot of people like it!